If you live in an area that is heavily populated with deer, it can be a challenge to find plants for your landscape that the deer won't eat. It can be frustrating to plant flowers in your garden, only to find that the deer find them to be a delicious snack. Although there are no completely deer-resistant flowers, you can find many varieties that deer rarely damage. Marigolds are low-maintenance, warm season annuals. Plant them from transplants or seeds for brightly colored flowers in shades of yellow, orange and gold all summer long. 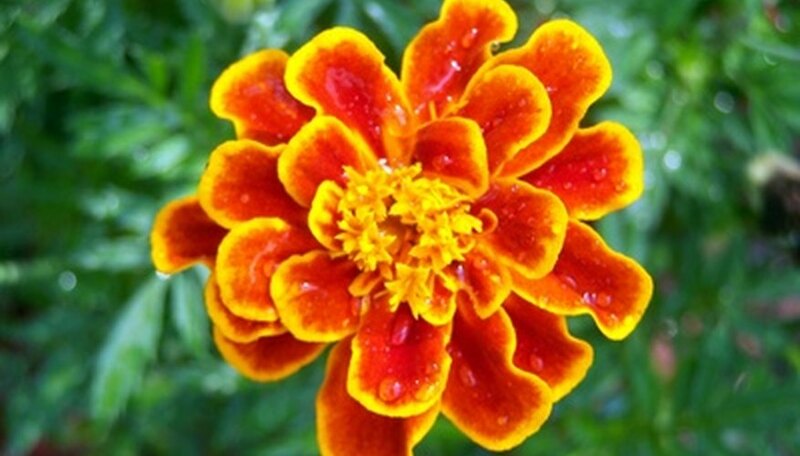 Marigolds thrive in well-drained soil in full sun. They can be used in flower beds and containers and as borders or cut flowers. Spider flowers are warm season annuals that provide balls of spidery flowers in pink, purple and white. Because they can grow up to 4 feet tall, they work well at the back of flower beds. Start them from seeds and plant in an area that receives full sunlight and is protected from the wind. Strawflowers are daisy-like annuals that bloom from spring to fall. They bloom in shades of purple, maroon, red, pink, bronze, yellow and white. Plant from seed in full sun and water whenever the soil becomes dry. Use the taller varieties in borders and cut flower gardens and the shorter varieties as edges or in window boxes and containers. For cool season flowers that deer won't eat try California poppies. Plant these brightly colored beauties from seed during the fall for large cup-shaped blooms in shades of yellow, orange, pink and red. They grow best in dry soils that receive lots of sun. Other varieties of poppies are deer-resistant also. Snapdragons are another choice for cooler weather. These tubular flowers bloom in every color but blue. They provide spikes of color in fall and spring and can be grown in sun or partial shade in rich, well-drained soil. Different varieties are classified by their heights--dwarf, medium or tall. Depending on the height, snapdragons can be used for borders, containers, edgings or in cut flower gardens.